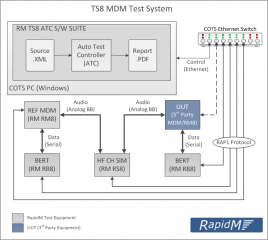 The RapidM TS8 Test & Evaluation System consists of a collection of hardware units, cables and automated test controller (ATC) software for the testing of HF data modems, ALE 2G/3G and ARQ controllers as defined by NATO STANAGs and Military Standards (MIL-STDs). 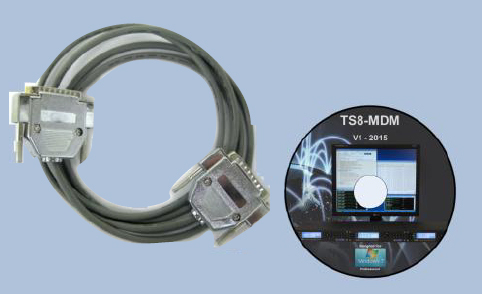 The TS8 system provides a scalable test and evaluation platform. The ATC software enables automated testing with minimal operator interaction. Purpose: Baseband testing of a 3rd party modem [Unit Under Test – UUT] making use of a RM8 Modem as Reference [Ref] modem, RB8 Bit Error Rate Test and RS8 HF & V/UHF Channel Simulator units. Test Coverage: Functional Verification and Interoperability with Ref Modem (Tx & Rx roles) and Performance Evaluation according to standard performances of narrowband SSB (3 kHz) & ISB (2x 3kHz) data modem functions. 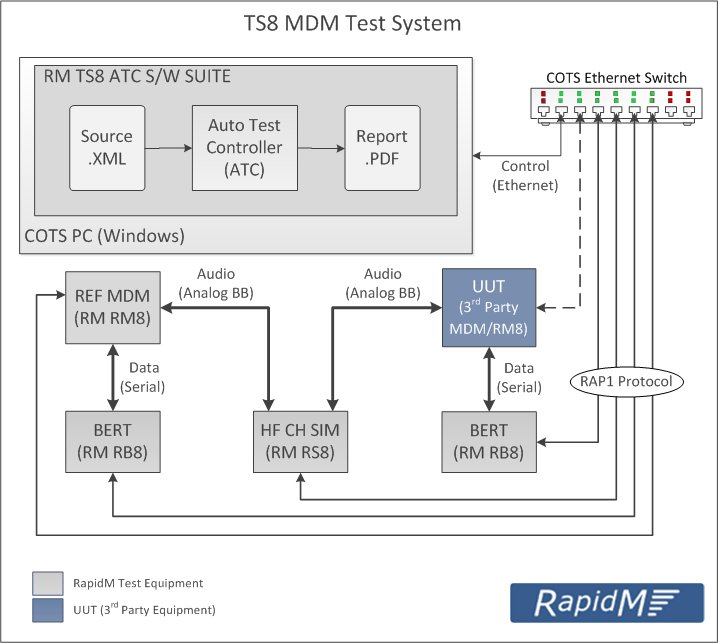 Test System: See TS8-MDM Test Setup diagram below. Purpose: Baseband testing of a 3rd party ALE controller [Unit Under Test – UUT] making use of a RM8 as Reference [Ref] ALE Controller and RS8 HF & V/UHF Channel Simulator units. 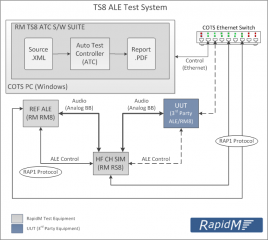 Test Coverage: Functional Verification and Interoperability with Ref ALE Controller (Tx & Rx roles) and Performance Evaluation according to standard performances of 2G ALE and 3G ALE/FLSU controller functions. In addition, the packet data modes as part of the STANAG 4538 specification (3G ALE/ARCS) are also tested. 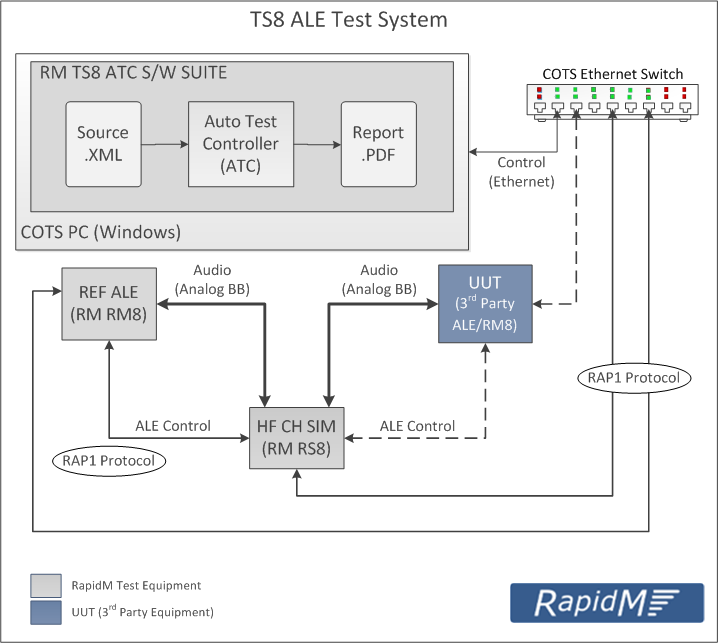 Test System: See TS8-ALE Test Setup diagram below. Purpose: Protocol testing of a 3rd party ARQ controller [Unit Under Test – UUT] making use of a RC8 as Reference [Ref] ARQ Controller, RM8 Modem & ALE and RS8 HF & V/UHF Channel Simulator units. Test Coverage: Functional Verification and Interoperability with Ref ARQ Controller (Tx & Rx roles) and Performance Evaluation according to standard performances of ARQ controller functions. 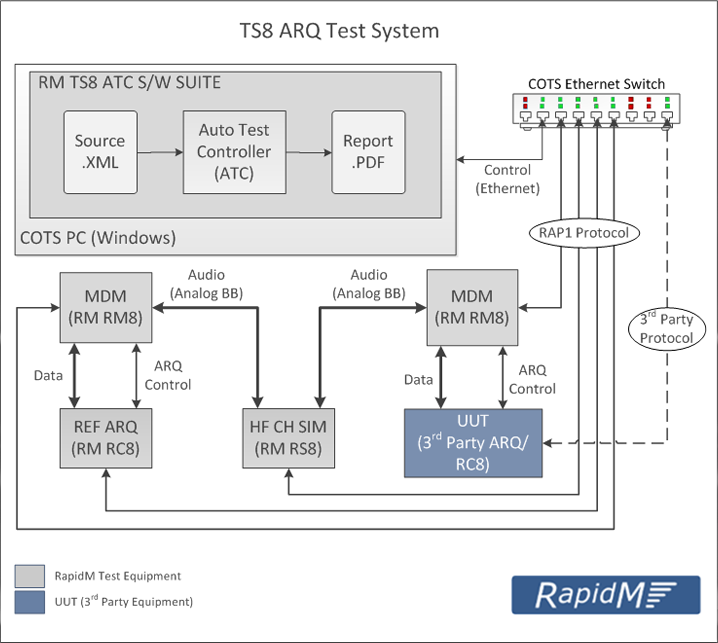 See TS8-ARQ Test Setup diagram below. The TS8 ships with the required hardware units, test cables and product CD. The product CD contains the test project source (.xls) and test scripts (.xml) as per STANAG and MIL-STD specifications. The TS8’s ATC acts as both the Test Manager and Controller. As the testing process is automated, the ATC interprets the test scripts and executes the procedure according to the test scenario. Test logs and result files are continuously produced during test execution. 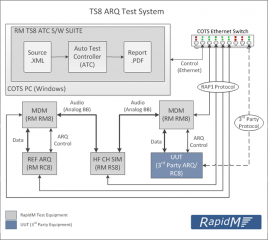 The TS8 test environment can easily be extended to cover the latest standard developments or enhancements. ATC Operation: See picture below. This product has not been associated with any families. This Product does not currently have any associated accessories. The RapidM RS8 standalone unit can simulate HF and V/UHF channel conditions for reproducible performance evaluation of modems and waveforms at baseband. It is suitable for the performance evaluation of MIL-STD-188-110C modem and MIL-STD-188-141C Automatic Link Establishment (ALE) solutions.